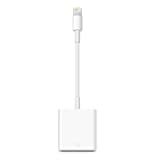 iPad ProのLightningポートはUSB 3レベルの転送速度をサポート。 | AAPL Ch. @iphone5att64 @jcscaliger @gruber @siracusa Ah. Apple told me it was USB 3 shortly after announce, but wouldn’t comment then on adapters. There’s no USB port on this iPad, but the Lightning port supports USB 3-level speeds with forthcoming adapters. Why not open that up more, with new accessories? Yes, admittedly, using cloud storage to drop files to and from the iPad Pro is easier than ever (although still more app-dependent than a regular Mac or Windows computer), and using AirDrop from an iPhone or Mac to the Pro works like a charm. And, yes, Apple is always famously pushing the envelope when it comes to dropping legacy ports and drives.